The most important step before launching a website is Website Testing. Website Testing means that we need to run our website through all necessary tests like Website Speed Test, Security Test, Cross Browser Compatibility, Accessibility Test, Responsive Design Test etc. Website Testing has a great impact on SEO, Conversion Rate, Bouncing Rate, Search Engine Ranking, Improved Security, Design of Web Pages, Cross Platform Tests etc. So it is very essential for web developers, to test a website before its launch. There are many great tools around which are being used by web developers to conduct Website Testing and identify related problems. Some tools such as Inflectra API testing, can combine different tests into one single test which can save you time. Here, we’ve listed ten great tools which you may use to test your website. Speed is the most important aspect of any website. In the present era, everyone expects a website to load as quickly as possible. A website that gets loaded with a lightning speed improves the overall browsing experience of a user. PageSpeed Insights is an online website speed testing service which provides guidelines to improve the speed and performance of a website, after analyzing its web pages. It is a free tool provided by Google. Red Exclamation Point represents problems that have a negative impact on page speed, and should be addressed straightaway. Yellow Exclamation Point signifies the problems/errors that you can fix if you want to, but they are not necessary. 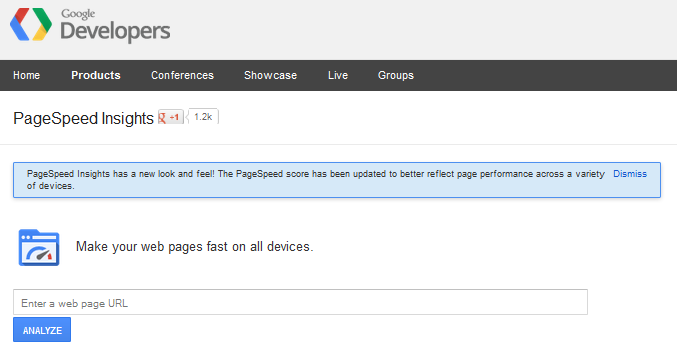 Green Check Mark symbolizes that no issues have been found related to the page loading speed. In addition to this, you can install its extension for Google Chrome via Chrome Web Store that is available for free. The number of hidden attacks and security threats are increasing day by day. The Internet of today is totally different from what it was some years ago. That’s why we have to make our websites safe and secure as much as possible. Watcher is basically a Fiddler add-on which is used by penetration testers to find web security issues. It is a passive vulnerability scanning tool for HTTP based web applications. The term “Passive” means it is safe for cloud, hosting & production environments. Watcher provides issues related to Information Disclosure, SSL, Flash, Unicode, Silverlight, Cookies, Mashups and Comments etc. It detects configuration issues as well as web security issues. It is very easy to use & doesn’t require any additional training or technical knowledge. When it comes to surfing the internet, users have a wider choice of browsers as well as devices. So it is our responsibility to create websites which can fit on all types of browsers & devices. Browsershots checks the cross browser compatibility of your website. It is an open source online web application. It generates screenshots of your website in different browsers and operating systems. To use this tool, you have to submit your web address. After submitting your web address, Browsershots adds it to its job queue. Several distributed computers will test your website in different browsers. After that, they generate screenshots of your web design and upload them to a central dedicated server of Browsershots. Website’s accessibility is also an important thing to improve your website. You need to design your website in such a way that it can be accessed anytime and anywhere. Improved website accessibility helps to get a better search engine ranking, improved usability, building positive public relations, etc. AChecker is an open source web accessibility checking tool. It was developed by the Inclusive Design Research Centre of the University of Toronto, in 2009. It is used to evaluate HTML content for accessibility issues. To use this tool, you have to submit a web page URL or upload its HTML file or paste the complete HTML source code. Potential Problems: These problems aren’t impactful in terms of accessibility, but you can solve them if you want to improve the overall accessibility of your site. Likely Problems: These types of problems are possible barriers which can affect the web accessibility. So you need to remove them to achieve better accessibility. Known Problems: These problems are called actual accessibility barriers. So you must make certain changes to your web pages to fix these types of problems and overcome all major obstacles that come in between better accessibility. The look of any website catches the attention of users. A right combination of colors on your website generates a great look for your website. So it is very necessary to select a suitable combination of colors. AccessColor helps you select right contrast and brightness combination for your website. AccessColor tests the color brightness and color contrast between the background and foreground of all elements in the Document Object Model (DOM). It is used to find the relevant color combinations within HTML & CSS documents rather than finding each value to input manually. It uses the color contrast algorithm suggested by the AERT (Accessibility Evaluation and Repair Tools). It analyzes both internal and external CSS and then calculates the color contrast and color brightness. If the brightness difference of two colors is greater than 125, then they provide good color visibility. AccessColor can either show a report or display errors and warnings. The errors appear when both color contrast and color difference fails, while warnings appear when either color contrast or color difference fails. It is very necessary for a website to work with the combination of different browsers, different languages as well as different operating systems. Selenium provides such type of automated tests for web-based applications to check Browser, Language & OS Compatibility as well as System Functionality. Selenium is an open source testing framework for web applications. It is based on Java scripting. It provides a set of variants that can be used to create a complete automation test suite. It was developed by Jason Huggins, in 2004. Selenium IDE: It is used as a Firefox extension. It allows user to record, edit and debug tests. Scripts are recorded in a special test scripting language called Selenese. Scripts are recorded automatically & edited manually with an auto completion support. It was originally created by Shinya Kasatani. Selenium Client API: It is an alternative to writing tests in various programming languages, rather than in Selenese. In the Selenium Client API, Tests communicate by calling methods with Selenium. Selenium Client APIs are available for Java, C#, Ruby and Python languages. It is the successor to Selenium Remote Control. It accepts commands either through Selenese or via Client API and sends them to a browser. It is a server which acts as a hub, and allows tests to use web browser instances that are running on remote machines. It allows running parallel tests on multiple machines and managing different versions & configurations of browsers with a central server called a hub. Marionette is also an automated driver having an API. For some particular web applications, request depends on the previous server’s response. To fulfill this type of requirement, “Extraction and Replacement Rules” concept is using by Solex. Extraction Rule tied to an HTTP message content binds an extracted value with a variable, while a Replacement Rule replace any part of HTTP message with a variable content. Solex is an open source web testing tool which acts as a HTTP proxy. It is being used as a plug-in for the Eclipse IDE. It can record, adjust and replay a client session. It records all HTTP requests and responses between client and server. Recorded requests can be filtered. Recorded sessions are saved in XML format. Allows the attachment of assertions to responses. Results can be exported in XML format as well as an optional XSL format. The man-in-the-middle attacks (MITM) are one of the dangerous attacks which are used by Hackers/Attackers. These attacks involve attackers diverting packets that should flow between victims’ host to another host and controlling the entire conversation between hosts. These attacks can be very dangerous when they are made on websites like your internet banking website, as the attacker has the power to capture all the information provided by your computer. Ettercap is a free web security tool for man-in-the-middle attacks. Its functions include capturing passwords, intercepting traffic on a network segment, content filtering on the fly, sniffing of live connections etc. It supports active and passive dissection of various protocols and can be used for computer network protocol analysis as well as security auditing. It supports BSD, Linux, Mac OS X, Microsoft Windows, Solaris platforms. MAC-based: Packets are filtered based on MAC address. PublicARP-based: Uses ARP poisoning to sniff on a LAN between two hosts (half-duplex communication). ARP-based: Uses ARP poisoning to sniff on a LAN from a victim host to all other hosts (full-duplex communication). Responsive Web Design is becoming more popular day by day because of tablet & mobile based web browsing. So we need to adjust our web pages in an order to adapt to different screen sizes. If a user browsing a website on his mobile finds that it isn’t a mobile-friendly one, he may move on to other websites. So you must provide your targeted users with a high quality browsing experience by providing them with an adaptable web design. Screenqueri.es is a free-to-use responsive design testing tool. It provides 30 different device resolution presets to test responsive design of your website. You can also check your layout with custom resolutions and change the orientation to check if it’s working as it should be or not. W3C stands for World Wide Web Consortium. It’s an organization which maintains standard guidelines for the World Wide Web (WWW). These standards help web developers to develop web pages which follow W3C standards. Like a spoken language, programming languages also have their own grammar, syntax and vocabulary. W3C validation is one of the best ways to find errors in programming languages such as HTML5 and CSS3 to keep them error free. A W3C Validator can analyze a markup of any website and show errors as per its standards. There are many benefits associated with W3C validation such as future-proof quality check, cross browser compatibility, increased load speed of web pages, easy maintenance & debugging, better search engine ranking and much more. So, these are some great tools to test your website before launching it. Since the internet users are increasing day by day, the web developers should step up to improve their website testing skills as much as possible. They need to develop web pages in such a way which can pass all types of website tests. A tested website gets more visitors as well as stability in the internet world. Hope, these tools will help improving your website as well your website testing skills. If you have any suggestion/query, you can leave that in the comment section given below. Thanks for sharing your thoughts about software.